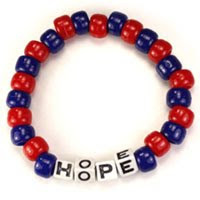 In past several weeks, we have spoken to many people who are fundraising for Haiti by making beaded key chains, necklaces and friendship bracelets featuring the word "HOPE"
One of the most popular fundraiser crafts are beaded friendship bracelets. Alphabet beads can be accented with colored pony beads or faceted plastic beads. All of these beads are great options for fundraisers because they are budget friendly, but will allow you to create friendship bracelets that are fun to wear and support a wonderful cause. Beaded friendship bracelets can be strung on elastic cord, knotted onto hemp, or braided or knotted embroidery thread. Cube shape alphabet beads are recommended if you would like to use thicker cord since cube shape alphabet beads have larger holes. The friendship bracelet pictured features blue and red colors from Haiti's flag, created with plastic pony beads and plastic alphabet beads. If you are using beads to create a fundraiser for Haiti, please use this coupon for 10% off your order of $36 or more, plus you will get free domestic first class shipping. Use coupon code: BEADSFORHOPE, Expires 4/30/10.